I am trying to do a PCR using a plasmid as the template, pretty basic stuff. 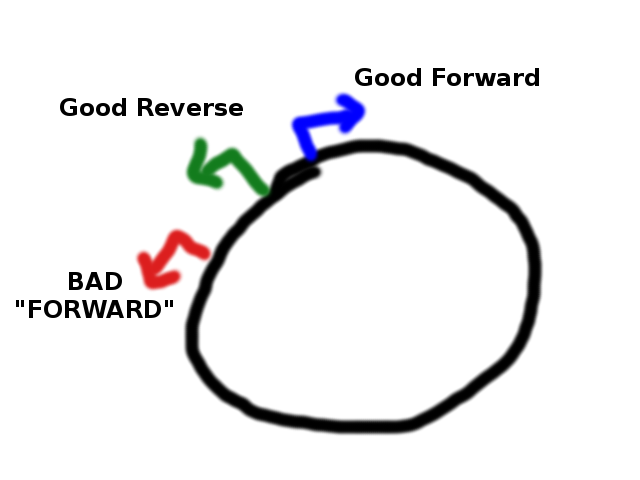 But the problem is that my forward primer just happens to bind to another location on the plasmid in the reverse orientation, in between the proper forward binding site and the reverse binding site. This isn't an example of non-specific binding, the sequences are perfect because the plasmid contains self-complimentary regions and my forward primer just happens to land right on it. Simply optimizing the melting point or magnesium concentrations probably won't help, because the sequences are the same. I'm doing this cloning to insert a reporter gene into the vector, and I need to place it very precisely, so I don't know if I can order a new set of primers, the insert needs to fit there. The bad PCR product is about 500 bases shorter than the good product, but I only see the bad band on gel when I run a normal PCR. If I reduce the amount of forward primer and increase the reverse oligo, I can see the good band, but the bad band is still there and the total yield is much lower. So my idea right now is to do an asymmetric PCR using the reverse primer only, then add forward primer to create the double-stranded DNA, then separate the good and bad bands using gel electrophoresis. But I don't have a clue how many cycles I should run each step, or how much forward primer to add, etc. Additionally, asymmetric PCR has low yield due to arithmetic amplification, but once I add the forward primers it can begin symmetric PCR and geometrically amplify both bands, but I think the shorter bad band wins out. Does anyone here have experience with this sort of complex PCR, or suggestions to improve my yield? From experience, your present problem will not completely go away no matter what you do. The idea for asymmetric PCR is not a bad idea. However, you will only get linear amplification of the desired product from the initial single primer, so you will not "see" any product even after 30-40 cycles. This first single primer PCR might also cause downstream problems with amplification of undesired products made during the second PCR (junk products). I agree with comment #1, but then neatly cut the "visible" "good" band out of the gel. Suspend (crush) the agarose band in sterile TE buffer, and then use an aliquot of that as template for a secondary PCR (use equal primers - maybe 30 cycles). This should provide more than enough "good" starting template. Alternately, you could design a new forward primer that does not have a bad secondary location on your plasmid.